Anna Kaplan came to OHMA with a BA in Anthropology with Folklore and Creative Writing minors from the University of North Carolina at Chapel Hill and a MA in Anthropology from Columbia. Since graduating from OHMA, she has worked on oral history projects of the Atlanta Fox Theatre and of women activists in Chapel Hill, NC. 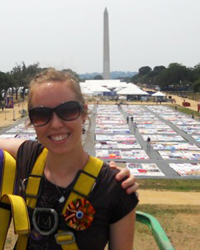 The past four summers she has worked on the Smithsonian Folklife Festival in Washington, DC. She is currently pursuing her PhD in History at American University, studying race relations in the southern US and the process of future generations inheriting memories of the Civil Rights Era.